When Rebekka first told me about an event called Yarncamp, I was quite surprised I had never heard of this event which took place for the 4th time in 2016. The information published in advance left me exactly as clueless about its content as I was before. A barcamp. What the hell does that mean? Why is there no schedule? What will be the session contents? All participants are organisers at the same time, how can that be? 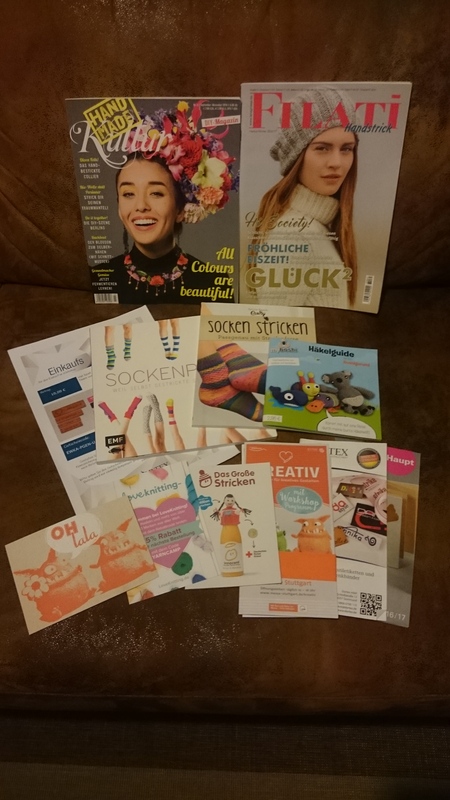 I attended social media and e-mail marketing, e-commerce and web shops and introduction to colour knitting. E-commerce and web shops was very interesting as the speaker has profound knowledge in this field and could answer even detailed questions he was asked. 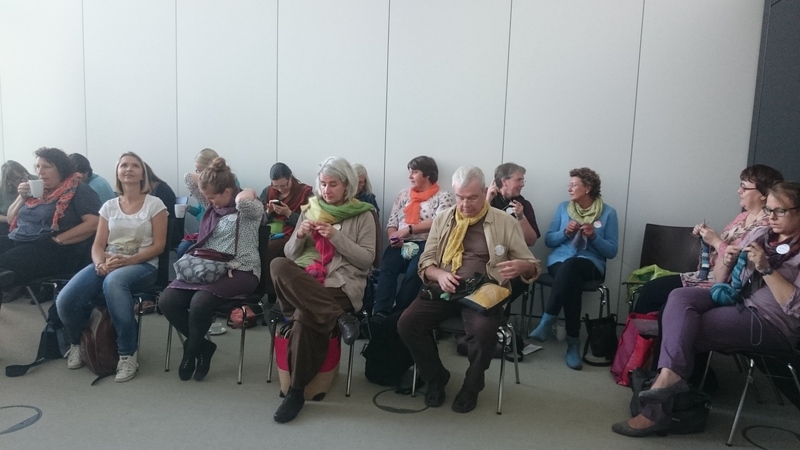 Introduction to colour knitting was intriguing as well, with lots of examples and clues on how to improve one’s technique. 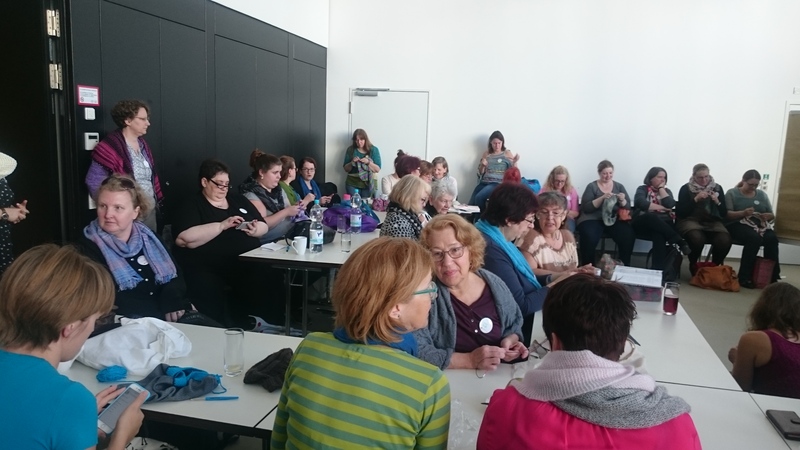 During the session breaks, there was time to knit and to get to know the other participants, surrounded by coffee and snacks. On sunday, I attended dyeing wool, steampunk, technical background of pop music and painting with wool. All my sunday sessions were gorgeous, apart from the fact that I held the one about music, so I hope my audience enjoyed it. Dyeing wool explained many different ways to dye yarn, including variegated colourways and the difficulties of dyeing rainbows. Steampunk was a faboulous introduction to the scene and its overlaps to goth, cosplay, LARP and many more. The same speaker also held the painting with wool session later that day and it was just as good and exciting as the steampunk session. 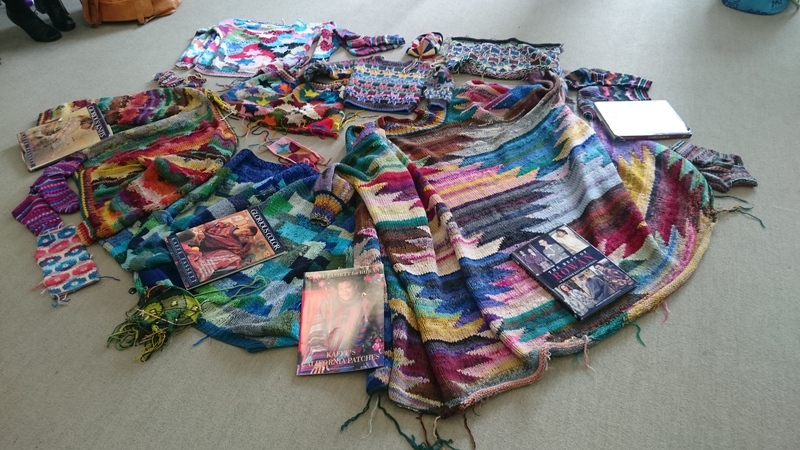 It also includes yarn and pattern for the Yarn Camp Shawl, an exclusive design for all participants for the moment. Thanks a lot for this cute idea! 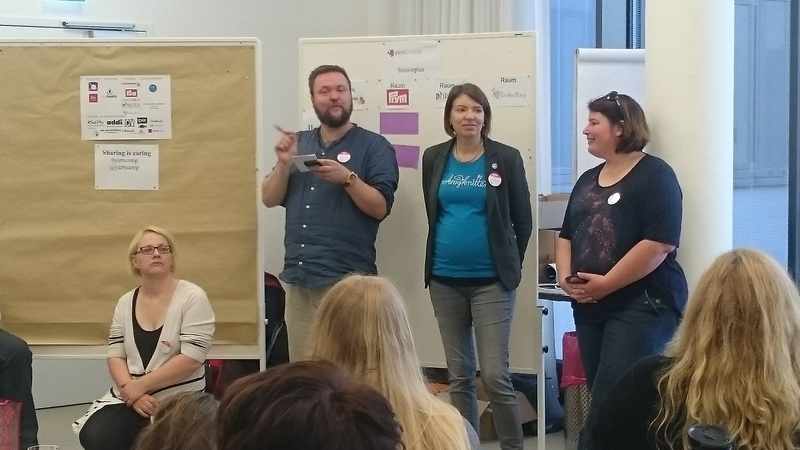 To conclude, I want to thank the organisers Rebekka, Lutz, Julia und Sara for a wonderful weekend. You got me hooked, see you all next year! One last note concerning the catering. I appreciate a lot the completely vegetarian and vegan catering and hope the organisers stick to this decision in the future. Sadly, one dish was labelled “vegan” instead of “vegetarian” on Saturday, which caused digestion problems with quite a few people on Sunday. It would be great if the caterer was more careful concerning possible allergies. 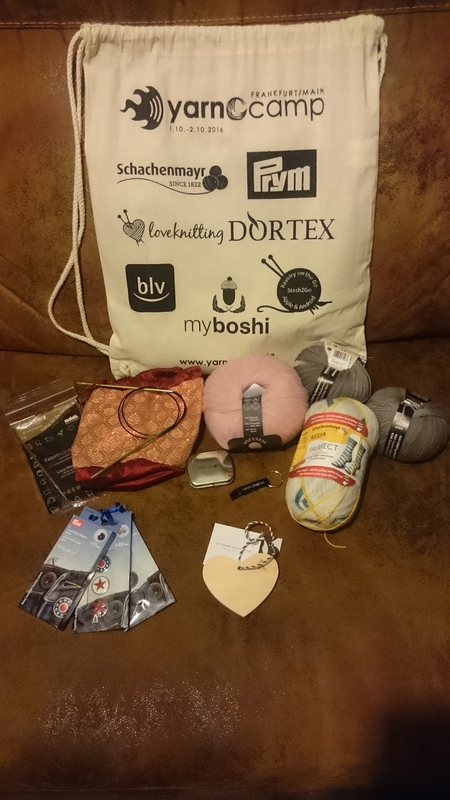 This entry was posted in craft events, knitting and tagged Frankfurt, knitting, yarn camp. Bookmark the permalink. Wow! 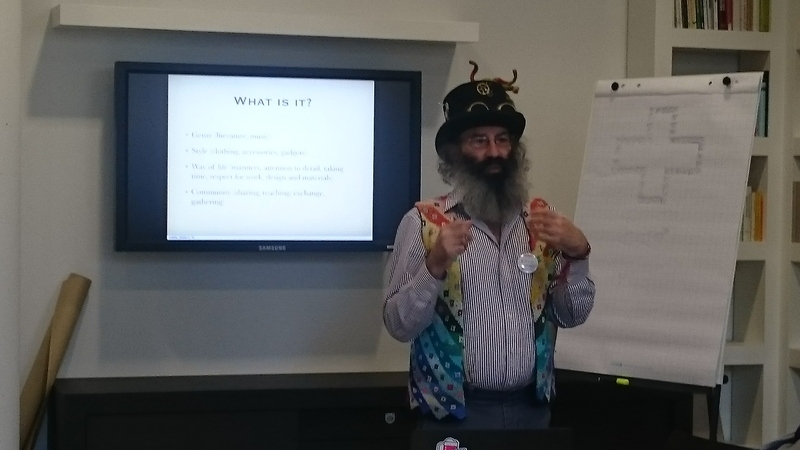 Yarncamp sounds really interesting – what a cool way to spend a weekend teaching & learning!